Frippery Digits: I had a not so lazy daisy.. I was changing some laundry over this morning and when my hand came out of the washer I had busted a corner right off my ring finger. :( That made three corners lost (my two pointers have been gibbled fora while now I was just stubbornly hanging on). So I decided I had to round them all off and start again. 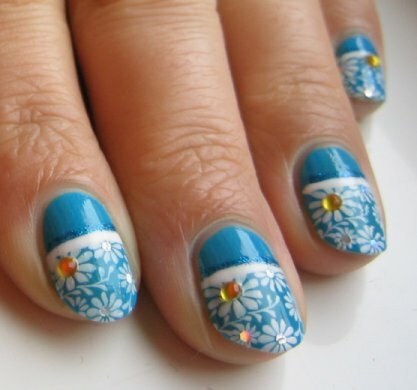 Used my new Sally Hansen X-treme wear Blue Me Away for the base colour. 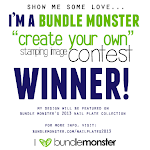 Then I stamped on the daisy image from bundle monster #16, turning it sideways and trying for straight across my nail. I used my new Kiss White Striper polish to draw a line across where the stamp meets the solid colour. Then I mirrored that line using my Art Deco royal blue sparkle striper. 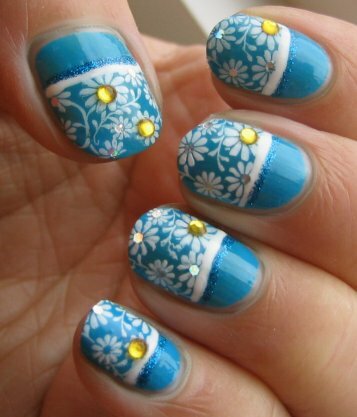 To finish I added a few yellow rhinestones to the center of one daisy on each nail and two on each thumb. I took my Cover Girl Disco Dazzle sparkle topcoat, and picked out the hex glitter, placing one in the center of every remaining daisy on each nail. Top coat and voila! 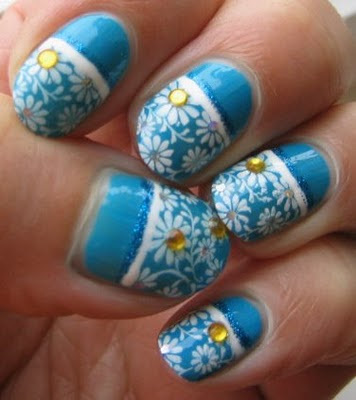 Blue but not so lazy daisies! I still love this mani. It might be one of my favourites yet. It reminds me of "Vincent and th Doctor". I know these aren't sunflowers, but all the same. That's what I think of.